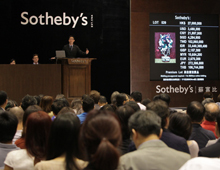 Record-breaking Chinese art sales are drawing Chinese mainland auction houses to Hong Kong. Following the success of China Guardian's recent debut auction, others are set to follow. Responding to Hong Kong's thriving art scene, Beijing-based gallery owner Meg Maggio has opened an outlet in Hong Kong. In Six Questions, she explains why locating her gallery away from the city centre makes sense. Sake is moving beyond the confines of Japanese restaurants, with Hong Kong-based entrepreneurs reaping the rewards of a growing demand for the Japanese brew. Narguess Sousi's children's retail concept has rapidly expanded since opening just two years ago. The French entrepreneur said Hong Kong offered her the tools for success. Master of Wine Debra Meiburg previews wine from some of the 930 exhibitors taking part in this year's HKTDC Hong Kong International Wine and Spirits Fair, 8-10 November, at the Hong Kong Convention and Exhibition Centre. Hong Kong is the setting for next week's event promoting British innovation and collaboration with the local creative industry. @ 2012 Hong Kong Trade Development Council. All rights reserved.